The final mop-up phase will begin shortly now the final number of nets required to fill gaps is known. 15 villages required additional nets (+4,845 nets) and 28 villages omitted from the initial pre-distribution survey have been added (+4,879 nets). The distribution phase will be completed by 7th December with 158,805 distributed to achieve universal coverage of the district of 370,000 people. Concern Universal, Malawi, our distibution partner, has done a terrific job working closely with the district health service in managing this distribution. We had hoped by now to conclude agreements to allocate the majority of nets we are currently able to fund. Despite our best efforts, however, we have not been able to do so. This is because we have not been able to reach a net distribution agreement for a major, country or province-wide net distribution with an appropriate level of accountability and transparency. As you know, these are key considerations for us as theft of nets at a material level can occur with large net distributions. If there were no, or limited, concerns over the potential material misappropriation of nets, it would be very easy to hand over funds for them. This statement does not indicate those potential partners with whom we have been discussing potential distributions tolerate the theft of nets. It does indicate we have not been able to achieve an agreement that would give access to information, enabling us to independently verify that nets would be distributed as intended, so we could report that to donors. Watch the developing world 'develop' in 3 minutes! A fascinating - and perhaps surprising - summary of progress in the developing world. A brilliant, clear, 3 minute video. Hans Rosling says 'Most people think the problems in the countries in Africa are unsolvable. But if the poorest countries can just follow [this path] it is fully possible that the world will look like this in 2030. Then there will be no countries left in the box we once called 'the developing world'. But to ensure that happens we must measure... By measuring the progress in the once labelled “developing countries”, preventable child mortality can be history by the year 2030.' We agree. With bednet distributions that help address the malaria problem, measuring means collecting data on net delivery and continued use, which also allows us to be accountable to donors as to how their donations are spent. - Donations show those that specifically funded the distribution. - Pre-distribution allows you to follow the work that goes on before a distribution takes place. - Distribution provides reports of what happened. 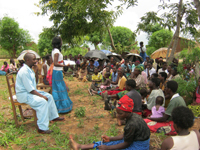 - Post-Distribution follows subsequent net use and malaria case rate data. Accountability and transparency of how we spend your money are two guiding principles for AMF. We hope these additions help that. 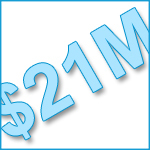 We have now passed the US$21 million mark, thanks to a donation from London, England! We also recently had our 76,000th donation too - from Melbourne, Australia. Our sincere thanks to everyone for their support and generosity. We were approached several months ago by PsyOp, a digital agency based in Los Angeles and New York, who offered to create, pro bono, an animation to help in the fight against malaria. We challenged them to come up with an animation that could be used as a platform to help encourage a million people to give one net each. The result, including a free-to-play game, will be launched at the start of December. See a preview of PsyOp and EGG's (Establishment for the Greater Good) impressive work. The Centers for Disease Control and Prevention (CDC) says 1,925 malaria cases were reported in the United States in 2011. This number is the highest since 1971 and represents a 14% increase since 2010.